I have a dear friend whose father horribly abused her in every way you can imagine and probably some that you can’t. Her life was a nightmare because her father chose her for his own evil purposes. Perhaps you can relate. Perhaps you’ve been chosen for abuse, for evil, for pain, for the worst of the worst. Perhaps you’ve chosen others for evil; evil upon evil. Could it even be that you attribute to God man’s imperfection, man’s evil? Is it possible that you condemn God for what man has done to you? It is time that we accept who God says He is and who He says we are. My friend, the truth is this, God chose you for good, not evil. The word, holy means to be morally pure, upright and blameless in heart and life. Blameless refers to the ones God chose before the foundation of the world and means to be without blemish, deserved or undeserved. The synonyms are: unblamable, guiltless, irreproachable, not chargeable in court, just, upright, uncondemned. Oh for the joy of it all! I was chosen for the very thing I desire with all of my heart and soul. But alas, I’ve never been able to be holy or blameless. For all my efforts, I constantly fail. I certainly want those qualities, but cannot attain them. What am I to do? I’ll never be able to appear before Him holy and blameless. Can you relate? That has been the cry of my heart most of my life. But Paul stated the solution in Romans 8:1. If you feel like you fail more than you succeed in the Christian walk, please listen carefully to this, Jesus does the work for us. He makes us holy and blameless. Oh precious one, Jesus is able to make you stand in His presence holy and blameless! When He died on the cross He cried out, “It is finished!” What was finished? The debt for your sin, all of your sin, was paid in full. Now in God’s sight, because of what Jesus did for you, you are holy and blameless. It is time to stop thinking about what you’ve done or what was done to you and start thinking about what Jesus has done for you. 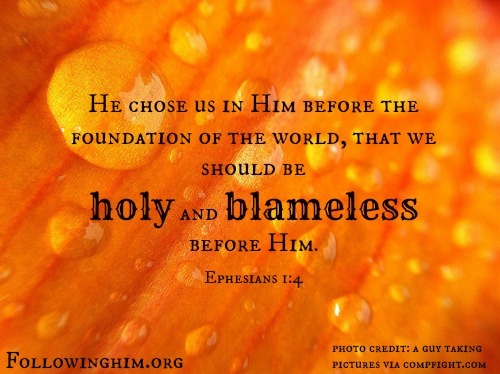 Praise Him for choosing you to be holy and blameless. He chose you for good, not evil. Now live like it!